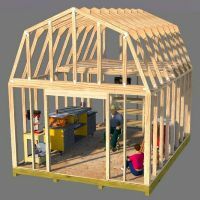 Using a speed square for measuring angle cuts for shed trusses. 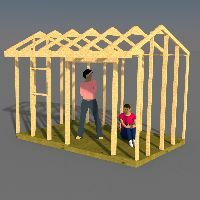 I am building a 12X16 shed and now having a problem with cutting the angels for the roof trusses the angles are on one end 23 degrees from end I guess what I am asking how do you get the degrees right? What instrument do you use and how? 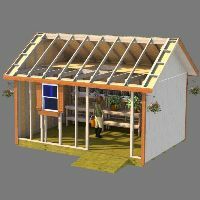 I have put some information on my website about how to measure the angles shown on my shed plans for measuring and cutting the angles for roof rafters and trusses. 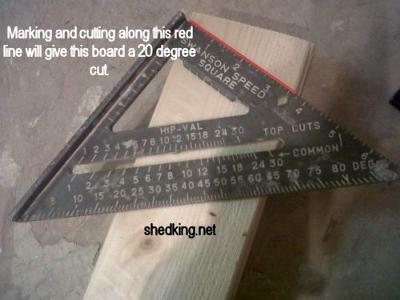 It is done very easily with a speed square, shown in the above picture. Hope this helps you out. If you are still confused let me know and I will try to make it clearer for you. I really would like to place some ads on your site, is it possible? 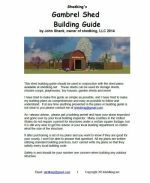 My site is Gunsafesmax and I think your blog is an ideal place for adveritising.